This rotisserie style hot dog cooker makes plump juicy hot dogs without the mess of a grill. The slow rollers keep cooked hot dogs or sausages, hot and tasting fresh. 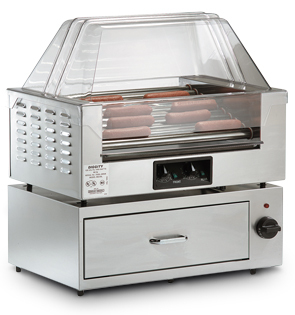 Dual temperature controls allow you to cook or warm your favorite brand of hot dog or sausage. The removable drip tray makes cleanup easy. A built in shield helps protect your hot dogs while they cook.